Alcohol stoves for hikers. Solid, rugged and reliable for your ultralight backpacking backwoods adventure. Continue reading "Gear for Adventure"
Lists of camping gear outlets. If you are looking for a local or online supplier of camping equipment these lists should help. Continue reading "Camping Gear Outlets"
This backpacking magazine, Etowah Outfitters Buzz will present info on backpacking and camping in a unique way. In New Zealand an earthquake struck Christchurch. Magnitude of 6.3 with aftershocks exceeding 5. Buildings toppled, streets littered with crushed cars. Feeds for current videos, blogs, news and quake survival info. Continue reading "New Zealand Earthquake Videos at Christchurch"
Continue reading "Etowah Backbacking Adventure Gear Store"
Continue reading "How to Backpack"
Ultralight silicon tarps for the serious long distance hiker. Outdoor Gear Catalog for the ultralight backpacker. Specialty tarps. Alcohol stoves and more. Continue reading "Outdoor Gear Catalog"
Ultralight tarps for outdoorsmen. Don't wear yoursef out with extra weight. Take o the woods with an Etowah Outfitters ultralight tarp. Etowah's super ultralight backpack, weighing 10 ounces, comes in two styles. The Whisper and The Pout. Outdoor news for backpacking, camping, outdoor sports and anyone who prefers outside to inside. The best backpacking recipes for your adventure outdoors. Backpacking food ideas to help you eat well and backpack light on your wilderness journey. 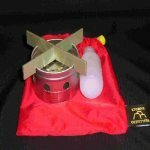 Continue reading "Backpacking Recipes for Your Ultralight Backpacking Menu"
The best backpacking tarps for lightweight backpacking and hiking weigh well less than a pound, are designed for quick and easy setup and are easy to repair in the field. Continue reading "Backpacking Tarps: Super Ultralight Backpacking Tips"